The car you drive can make a passionate statement about who you are. A Porsche driver values power, luxury, and performance. For the discerning driver, the choice for a luxury sedan is easy: the 2019 Porsche Panamera. This uniquely configured, 4-seat executive car is consistently ranked as one of the top super luxury cars for its unparalleled features, both inside and out. The Panamera is also one of the most customizable Porsche models with 18 available trims and six engine options. New for 2019 are the GTS and GTS Turbo trims which offer a hand-curated collection of Porsche's most-desired performance parts with a sporty blacked out exterior style. Adrenaline junkies will continue to get their fix from the ultra-powerful E-Hybrid Turbo. 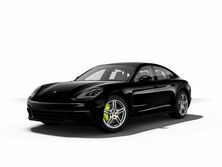 We offer the following review of the 2019 Porsche Panamera's features and model year upgrades to help you research your new luxury performance vehicle. 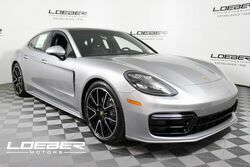 We also invite you to experience the unmatched thrill and comfort for yourself as you test drive the all-new 2019 Porsche Panamera at Loeber Porsche near Park Ridge, IL. The 2019 Porsche Panamera comes in four trim categories: the standard, the GTS, the Turbo, and the E-Hybrid. 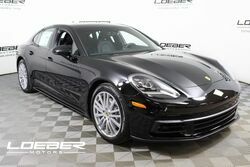 The base Panamera offers a 3.0L V6 engine putting out 330-horsepower and a top track speed of 164 mph. On the beefier end of this trim category, the Panamera 4S Sport offers V6 440-horsepower with a top speed of 177 mph. The next trim upgrade is brand new for 2019: the Panamera GTS with 4.0L V8 453-hp engine with a top speed of 181. To get even more power, consider the Panamera Turbo V8 with a whopping 550-hp and 190 mph top speed. For the eco-conscious and those looking to save money at the pump, the E-Hybrid offers a 2.9L V6 engine alongside a 136-hp electric motor. The E-Hybrid Turbo is still an impressive engine with its 680-hp hybrid powertrain. 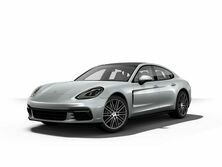 One of the biggest draws of the 2019 Panamera is the ability to put a high-performance engine in a variety of four-door configurations. The sedan and the hatchback options give drivers a choice of exterior style as well as choice of cargo configurations. Various trim levels offer exterior options like elongated roof lines, spoilers, 20” wheels, black out trim, and other fine touches. With a range of standard colors and finishes as well as vibrant Sapphire Blue, Mamba Green, and Carmine Red shades, the 2019 Porsche Panamera suits every taste. We spend more time than ever inside our cars, so why not make it as comfortable and enjoyable as possible? The cabin of the Panamera is replete with soft surfaces and optional creature comforts such as full-leather upholstery, 18-way power seats, massaging front and rear seats, and even 8-way power rear seats. The panoramic moonroof and quad-zone climate control allow a range of cabin conditions. Perhaps one of the most unique features for this four-door vehicle is the two-seat rear boasting a touch-screen center console and extra-roomy bucket seats. Let your rear passengers feel the joy of Porsche luxury, too! The 2019 Porsche Panamera offers one of the widest ranges of interior options on the market, including choice of two-tone interior materials and trims available in fine woods, carbon fiber, or aluminum. For the ultimate tailor-made feel, Porsche can even customize the interior color to any you like. The hub of your 2019 Porsche Panamera is the seven-inch touchscreen console which can display everything from navigation and music to engine information. The Porsche-exclusive Burmester 3D Surround Sound system is one of the best sounds experiences available anywhere in the world. This 21-speaker system can be directed through the touchscreen console to enhance sound in any one seating position. 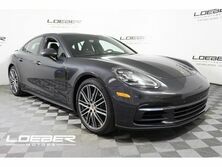 Our Loeber Porsche dealership near Park Ridge, IL excels at making unbeatable deals on even the most luxurious vehicles. 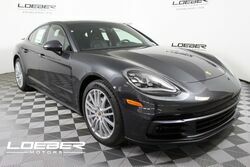 Our inventory of 2019 Porsche Panamera is available at the best prices thanks to our expert finance team's ability to combine National Porsche Lease Offers with other Loeber-exclusive specials. We work closely with you to create the ideal purchase or lease deal based on your available money down, desired monthly payment, preferred term length, and credit score. With our sales team's ability to combine vehicle options in seemingly limitless combinations, you're sure to find the exact right Porsche package for you and your lifestyle. 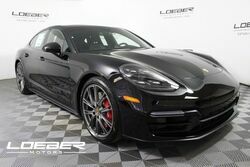 Why Buy from Loeber Porsche Serving Park Ridge, IL? We know luxury, and for Loeber Porsche, it doesn't stop with the vehicle. We make it our mission to provide a luxury experience from the moment you step foot in our showroom, and promise to keep this VIP experience going for life. That's why we are consistently rated as one of the top new & pre-owned inventory near Park Ridge, IL. Our helpful sales team, dedicated finance team, and experienced service team will treat you right—that's our promise to you!